A good race is made up of several things: a safe and scenic course, pleasant weather, enthusiastic volunteers, and solid organization make up most of those components. The 2018 Naperville Trails Half Marathon excelled at delivering on all these this past Sunday at Danada Forest Preserve in Wheaton. The event helps support the Special Olympics of Illinois. The race is hosted by All Community Events, an organization that stages many running events throughout the Chicago-area all year. I arrived at the race site early enough that I was able to find parking in a public lot about a block away from the race start. The race’s website said nearby parking was limited and once filled participants would have to park at a corporate parking facility about 2 ½ miles away. Free shuttle buses would transport runners back and forth to the start/finish area from there. Packet pick-up and gear check was quick and easy. There were many volunteers on hand to assist runners. 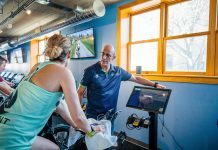 As I went through my little pre-race warmup routine I talked to some other runners about the course, training, and the weather. They were all pleased with the cool morning air; the temperature was 60 degrees with a light breeze and skies were overcast. This made for a much more comfortable race to run in compared to the temperatures experienced in the weeks beforehand. After some pre-race announcements, runners lined up at the start line according to their pre-determined race pace. I saw many designated race pacers scattered throughout the starting field ready to lead runners who would look to them to finish at varying times. I took some video of the race start as the fastest runners funneled their way out of the start corral and then walked past spectators on the sidelines and found my way into the race crowd. We made our way out of the start area, took a right turn taking us under the Naperville Rd. overpass and onto crushed limestone, and my knees and my feet were immediately delighted. I relish every chance I get to run on a soft surface and this entire course is run on soft, shock-absorbing, cushioning crushed limestone. I knew I wouldn’t have to do as much icing of the joints afterwards. The course leads you past Rice Lake and at about 2 ¼ miles from the start runners turn around and head back on the same portion that led them to this turnaround. Leading up to this turn-around you can see runners that are ahead of you, and after you make the 180-degree turn on the path you see the runners following you. Sharing the trail with runners going in the opposite direction can make it feel a bit congested at some points along this portion, but everyone managed and filed in behind others where necessary, so everyone could stay moving. As the race neared the finish line, the last one-third of a mile is run on a grass-covered equestrian racetrack. This makes for an interesting finish. I spoke with Andy Olson who took first-place in his 30-34 age group and fifth place overall. He told me this was the third time he’s run this race and enjoyed the course very much. 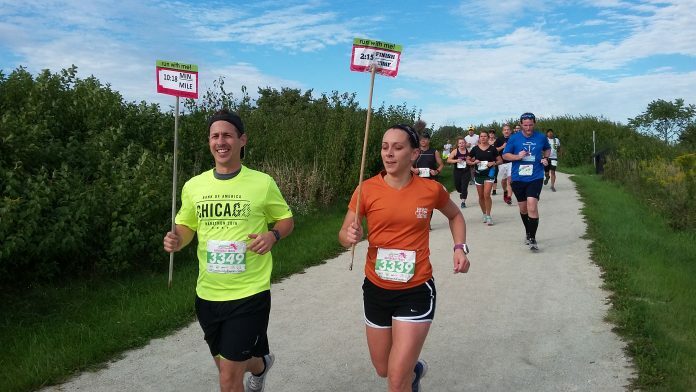 From everyone I spoke to I heard only good things about the Naperville Trails Half Marathon. I would highly recommend this race to a first-timer or a seasoned runner. I’d also like to congratulate fellow Chicago Athlete Ambassador Mandi Florip on her second-place finish in her age group and eighth place female overall. Way to go!